Both R and Python are the two most popular open-source programming languages oriented towards data science. 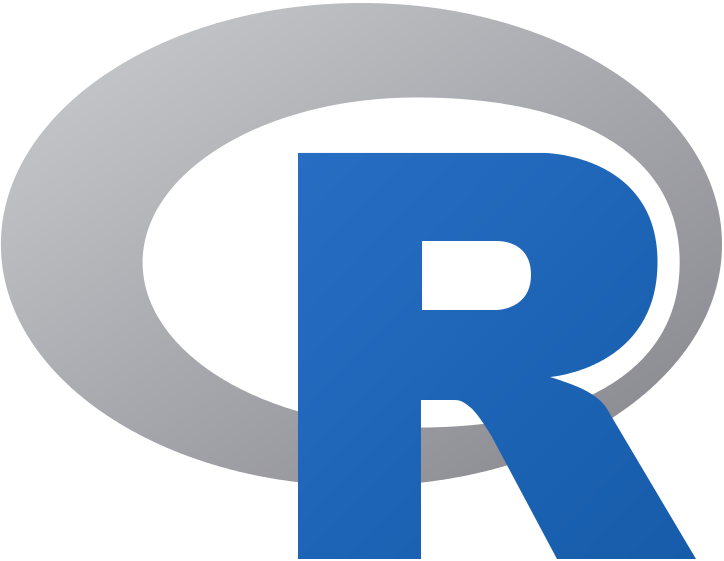 R is the latest cutting edge technology widely used among data miners and statisticians for developing statistical software and data analysis. R is a powerful programming language which is rapidly becoming the de facto standard among professionals and has been used in every conceivable discipline from science and medicine to engineering and business. However, the technology is not without its fair share of downsides. R is not particularly a fast programming language and the poorly written code can be fairly slow. Python is well known for being great with big datasets and flexibility but still catching up to the number of good statistical libraries available in R. But which of these languages is easy to use and best to learn? R is a powerful open-source programming language with aspects of both functional and object-oriented (OO) programming languages. R is more than just a computer program; it is a statistical programming environment and language for statistical computing and graphics. It began as a research project by Ross Ihaka and Robert Gentleman in the early 1990’s and by 1995, the program had become open-sourced meaning anyone could modify or alter the code absolutely free of cost. The first version was released in 2000. Since then, it has been used in every conceivable discipline from science to engineering. Technically, it is both a language in statistics as well as computer science and analytics software with significant usefulness in data analysis. The feature rich library of R is what makes it the most preferred choice for statistical analysis. Python is yet another high-level object-oriented programming language widely used in scientific and numeric computing. It is used on the server side because of its multiple programming paradigms which involves imperative and object-oriented functional programming. Python allows you to work more quickly and integrate your systems more effectively. The foundation of Python goes back to the late 1980’s. It was originally conceptualized by Guido van Rossum in 1989 and the first version of the programming language was introduced in 1991, and later named “Python”. It has gone through several updates since then and is now one of the most popular open-source programming languages used among the community. It is also one of the widely used languages used in data science, second to R.
– Both R and Python are two most popular open-source programming languages used for statistics and data analysis and both are free. However, Python is a general-purpose multi-paradigm programming language which provides a more general approach towards data science. R, on the other hand, is more than just a computer program; it is a statistical programming environment and language for statistical computing and graphics which seems to be much better at data visualization. The term environment in R characterizes a fully planned and coherent system, rather than an incremental accumulation of specific and inflexible tools with other data analysis software such as Python. – R is a computer program and statistical programming environment which allows a wide range of analytical methods to be used and produces presentation-quality graphics. It’s mainly used for statistical analysis keeping statisticians in mind. It handles complex statistical approaches as easily as simpler ones. It is unlike most of the programs that can deal with a huge variety of mathematical and statistical tasks. Python can do pretty much all things that R does. It is known for its easy-to-understand syntax which makes coding and debugging much easier than with other programming languages. – IDEs integrate several tools specifically designed for software development. One IDE, IDLE, comes as a part of the standard Python installation package since 1.5.2b1. Over time, other IDE’s have sprung up which incorporate some of the some of the more popular libraries not provided by IDLE. Some of the popular Python IDEs are Spyder, Atom, PyCharm, IPython Notebook, Eclipse + PyDev, and more. Some of the popular R IDE’s include RStudio, RKWard, R Commander, Emacs + ESS, and more. Popular packages include Stringr, Zoo, Dpylr, Data.table, and so on. – R is a functional yet sophisticated programming language and environment for statistical computing and graphics. It is easy to pick up and has a huge number of packages particularly dealing with analysis of data. As it is open-source, it provides more flexibility which in fact provides the ability to extend and modify the analytical functionality to your organization’s needs. Python can be used to develop both GUI applications and web applications and because it’s a general-purpose language, it can be used to build literally anything, with the right tools and libraries. However, it has not as many libraries as R.
Both R and Python are high-level open-source programming languages and amongst the most popular in data science and statistics. However, R is more suitable for traditional statistical analysis whereas Python is often used for traditional data science applications. R has a steep learning curve and people without any prior experience would find it difficult to grasp the language at the beginning. Python is relatively easy to learn because it focuses on simplicity and as it’s a general-purpose programming language, it can be used to build almost anything, with the right tools and libraries. Python is well known for being great with big datasets and flexibility but still catching up to the number of good statistical libraries available in R.
Sagar Khillar. 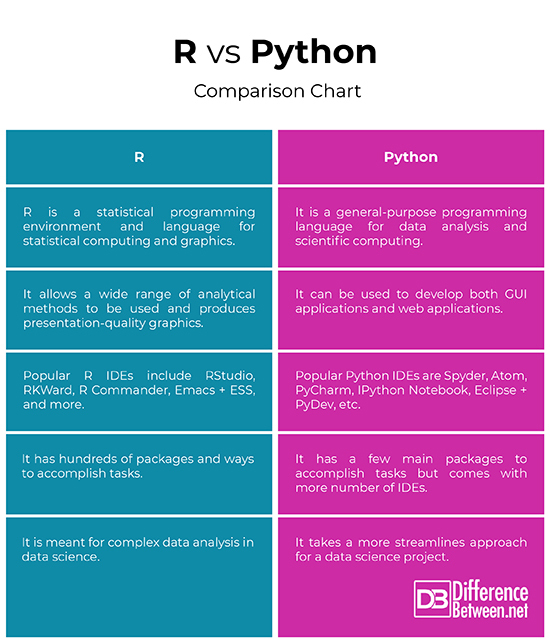 "Difference Between R and Python." DifferenceBetween.net. March 5, 2019 < http://www.differencebetween.net/technology/internet/difference-between-r-and-python/ >.